What do you do when the battery fails on you dive computer when on holiday ? You will learn a lot more about decompression theory on this course. Which will be very useful when you continue on the professional level courses when you need to know more about decompression and how to use the wheel. Don't wait until five minutes before your instructor exam!! To stay even longer you can combine multilevel diving with Enriched Air diving then you can really lengthen your bottom time. Of course all this will be of no benefit unless you get your breathing rate nice and relaxed, even then you will gain the benefits if you learn to use twin tanks by completing a Tec Basics course. If you want to take this further then you can complete a Tec 40 where as well as using a twin set you learn to make gas switches to Nitrox mixes with up to 50% Oxygen to extend your range without ever going into required decompression stops! 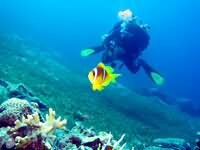 Aqaba is an ideal place to practice this type of diving as there is plenty to see at all depths. 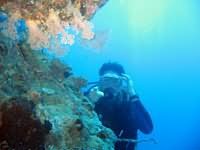 There are many gently sloping reefs where you can continue your dive from the limits of recreational diving to your safety stop. If you are using a dive computer for determining your dive plan you need to know the theory behind it!